In Bringing Nature Home, the flower arrangements vary from incredibly lush gatherings that hint -- just hint -- at an Old Master still life (the book's contemporary arrangements are much looser and uncontrived) to very spare, Asian-inspired approaches. And a California influence can be felt too. 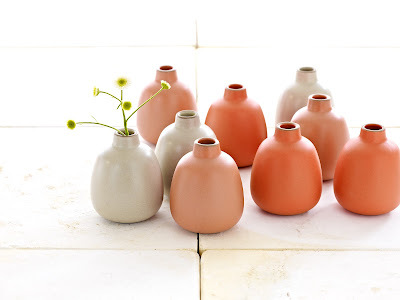 It seems fitting then, while you wait for me to post my interview with author Ngoc Minh Ngo, to offer a peek at the handmade Hybrid Vase Set from California-based Heath Ceramics. 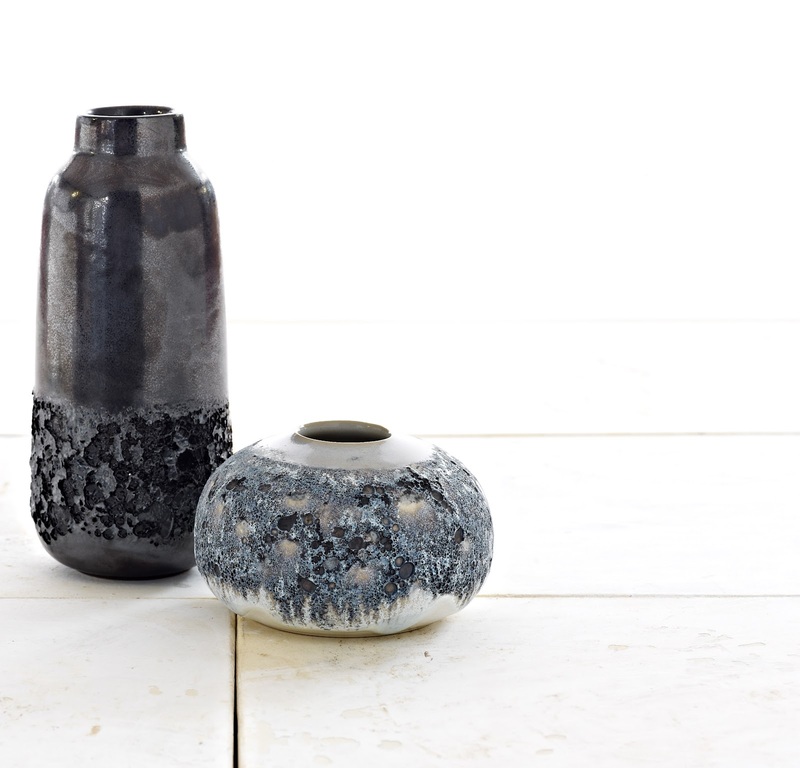 In addition to their iconic dinnerware, Heath continues to craft wonderful vases in Sausalito, California. 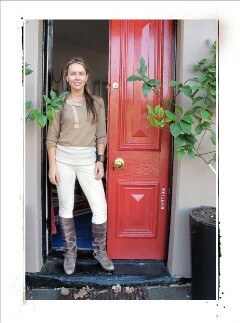 Rich color informed the summer 2012 collection, available in limited quantities beginning April 1. With everything blooming so far ahead of schedule this year, I might not have been shocked to see a few magnolia blossoms during today's visit to the Atlanta Botanical Garden; none yet, but I'm already picturing some glossy green leaves in the taller vase above. 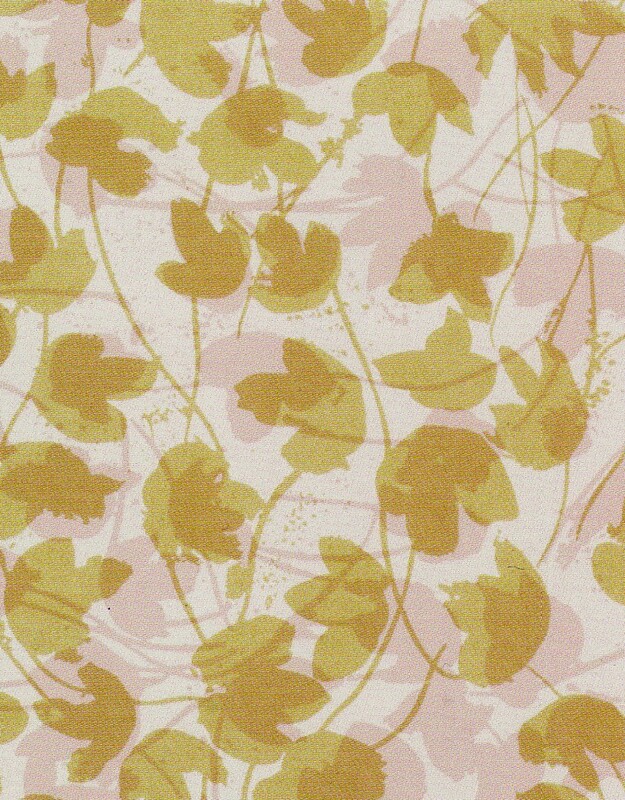 More new wares, in California poppy shades, below. Bud vases are $25 each or $70 per set of three (one of each color). A memorable image I once posted came from textile designer Seema Krish. Back in 2009, she shared with us some pictures of her studio including one photo in which a little mantra taped to a shelf popped out among the colorful books: "Nothing is worth more than this day." I think this theme is echoed throughout Ngoc Minh Ngo's gorgeous, soon-to-be-released book, Bringing Nature Home. In the book's foreward, Deborah Needleman writes, "...flowers speak to the present moment...the quotidian nature of [Ngoc's images], and the moments they evoke, reveal that somehow the everyday is more special than any special occasion." So, it's not about waiting for that big bash or even the Saturday night dinner party -- flowers and foliage are for the here and now. Attention Angelenos: LACMA's East Asian Art Council is kicking off April with a special talk, The Changing Landscape of the Chinese Art Market. Christie's Tina Zonars and Ingrid Dudek will address evolving tastes, shifts in collecting habits, and trends. The Sunday afternoon lecture is scheduled for 3 p.m. on April 1, and general admission is $10. 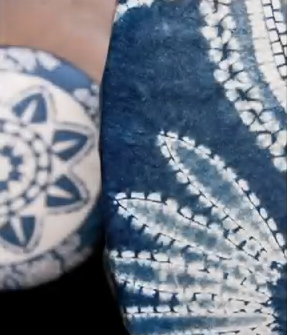 The rich blues and organic motifs in LACMA's platter, at top, have my mind wandering back to the Chinese Hand-Printed Blue Nankeen Exhibition Hall and to Woody Woodroof's cyanotypes. The latter will soon be exhibited at the Ogden. Often a picture says it all. No words are needed. Some days you'll find me compiling commentary-free inspiration boards over at tumblr. Mixed in with my own photos (sorry about that) will be books and other newly found resources. If the picture wasn't snapped by me (or in some cases even if it was), clicking the image will take you directly to info about a cool event, lesser known magazine, or object that simply caught my eye. Now, to kind of contradict what I just said, a few words about this weekend's tumblr postings: The highlighted book links to Amazon UK because that's where I found the clearest image, but the title is also available through Charleston's gift shop and various used-book sellers in the States. Roger de Grey's Interior, Exterior oil on canvas will take you to an interesting BBC site, Your Paintings. There you'll find a vast online catalogue of works in the UK's national collection. Accessing it, I came across more paintings by Vanessa Bell, Duncan Grant, and other artists represented in Charleston's collection. 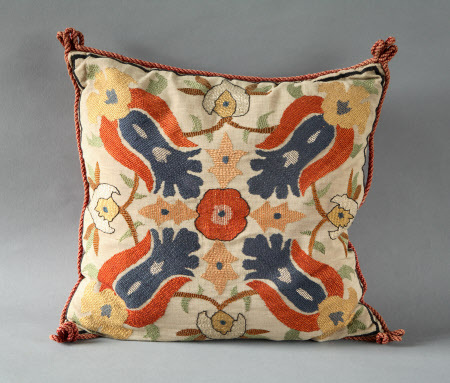 That hundred-year-old embroidered Turkish pillow I posted earlier this month -- the one from Dunham Massey with the bold, stylized floral -- is among the most striking things I've seen in a while. 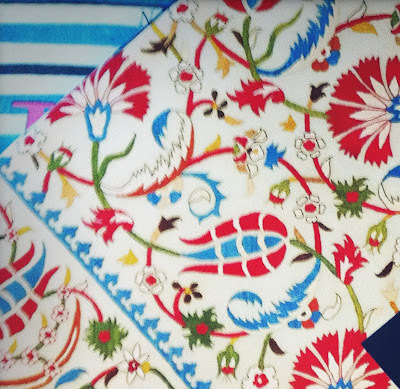 But, admittedly, I have a weakness for stylized interpretations of botanicals: patterns like the Textile Museum's fragment pictured above, a colorful 17th or 18th-century piece featured on the cover of Flowers of Silk & Gold: Four Centuries of Ottoman Embroidery. No surprise then, I was excited to learn that the Museum's major fall 2012 exhibition will focus on stylized honeysuckles, roses, rosebuds, tulips, carnations, and hyacinths created by 16th-century Ottoman court artist, Kara Memi. 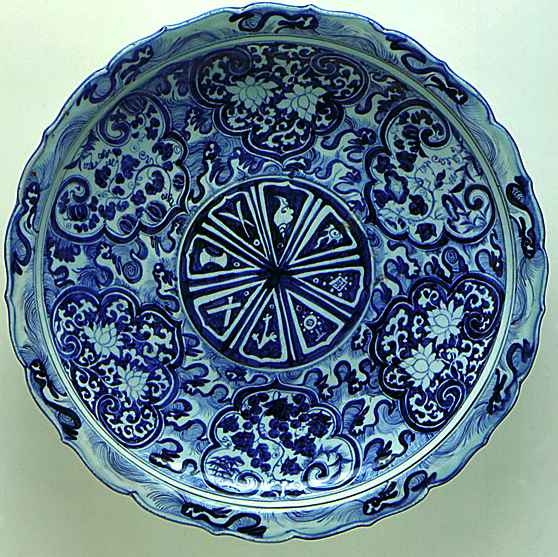 Learn about the show, The Sultan's Garden: The Blossoming of Ottoman Art, here. 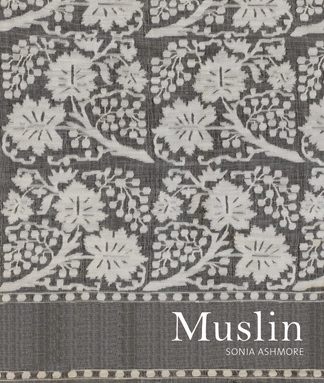 In other textile news, the V & A has already released a few tantalizing preview images of Sonia Ashmore's Muslin. It won't be available until November 2012, but I'm going ahead and adding it to my wishlist. 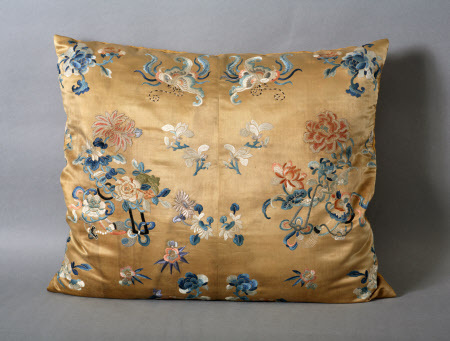 With 900 examples from the V & A's collection as her base, and traveling from India to Europe and the States, Ashmore tells the story of this ultra-fine cotton. Sneak a peek here. I've been exploring My Met, a new, free, easy to access interactive service created by The Metropolitan Museum of Art. 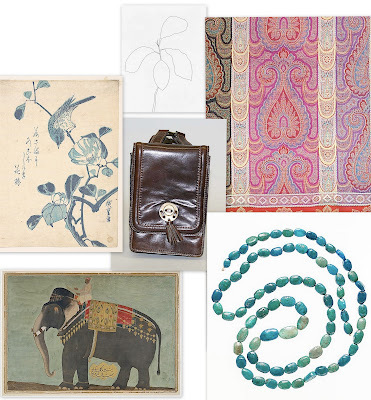 Curious to see who else shares your obsession with Indian-inspired French paisley, vintage Italian bags, or Egyptian faience? 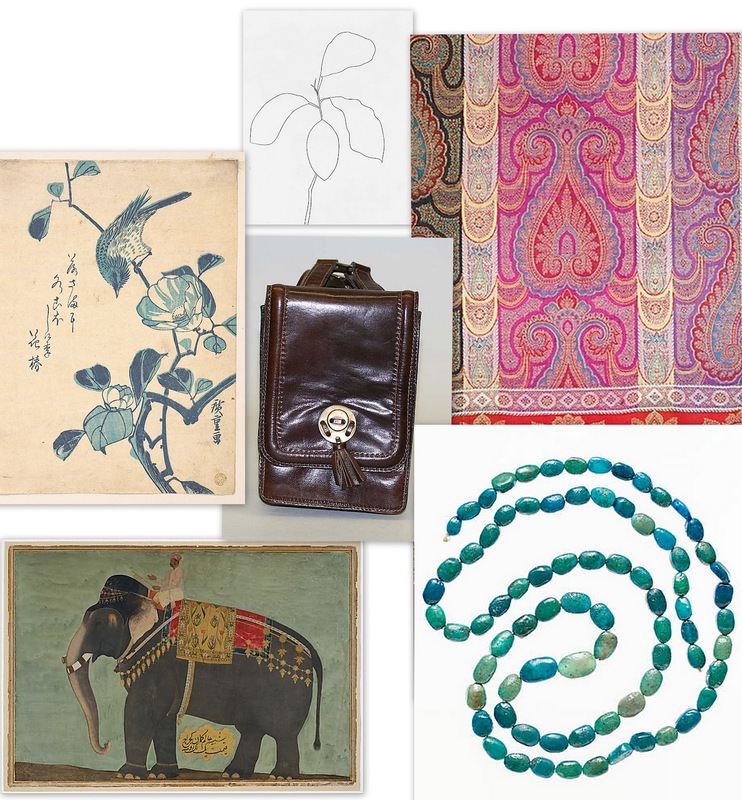 Want to let Met curators know which objects in the Museum's collections most inspire you? My Met makes it easy to do so via Pinterest, Tumblr, Twitter, etc. But there's a less public side to the feature, too. 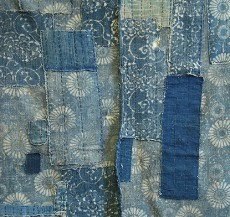 I initially used the service to hone in on very specific interests -- a few were blue-green beads, striped textiles, and botanicals. By tapping a string of New Kingdom scaraboids, I received a reminder that a new exhibition, The Dawn of Egyptian Art, opens April 10. I could also determine which of my favorite pieces are currently on view in the galleries and which aren't. 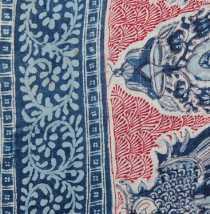 Detail view of a 19th-century wool, silk 'paisley' shawl. More on paisley here. Egyptian faience scaraboids with a Downton Abbey connection. Lord Carnarvon and Howard Carter excavated the strand in 1911 and it was later purchased by the Museum from Lady Carnarvon in 1926. Portrait of the Elephant 'Alam Guman, circa 1640. If you're a fan of old Indian art, don't miss Enfilade's coverage of the Asia Society show, Princes and Painters in Mughal Dehli 1707-1857. Camellia and Bird by Utagawa Hiroshige, circa 1833. Italian leather bag, late 1960s. 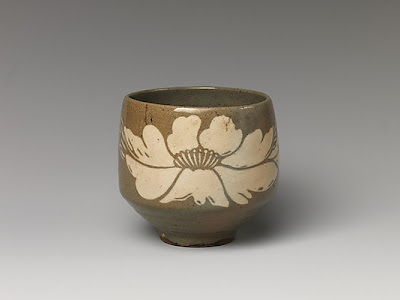 Learn about the Edo period tea bowl with peony here, and Gauguin's handmade portfolio here. BTW, in related news, over at Enfilade, Craig Hanson reports on the recent launch of our National Gallery's new public service, NGA Images. Read all about it here. Driving around Atlanta this weekend, it appeared as if many of our flowering trees were peaking, but I haven't fact checked it. What I did consult is a National Cherry Blossom Festival news feed; as of today, the D.C. trees are predicted to peak March 20 through 23. 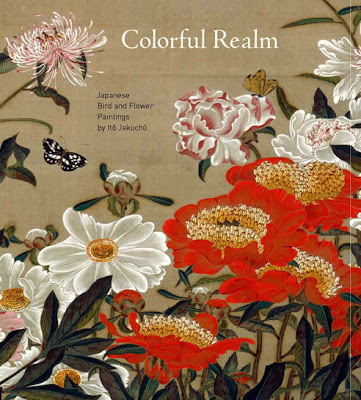 The dates for a related NGA exhibition I mentioned back in January -- Colorful Realm, a landmark show featuring the treasured 30-scroll set of flora and fauna paintings by 18th-century artist Itō Jakuchū -- remain the same, March 30 through April 29. A friend in the know tells me that people are traveling from across the globe to see the scrolls because the works are rarely exhibited in Japan and the set has never before been shown in its entirety outside of the country. 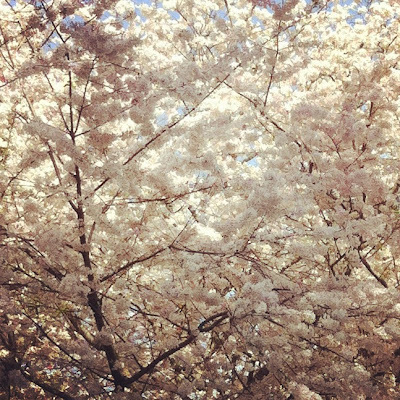 The unprecedented display was organized to celebrate 100 years since Japan’s massive gift of cherry trees to the U.S. I've also been told the new exhibition catalogue is gorgeous. If you'd like to buy a copy in support of the NGA, the books are now available through the museum gift shop. Fun Fact: Peter Max was chosen Official Artist for the National Cherry Blossom Festival Centennial Celebration. See the poster here. 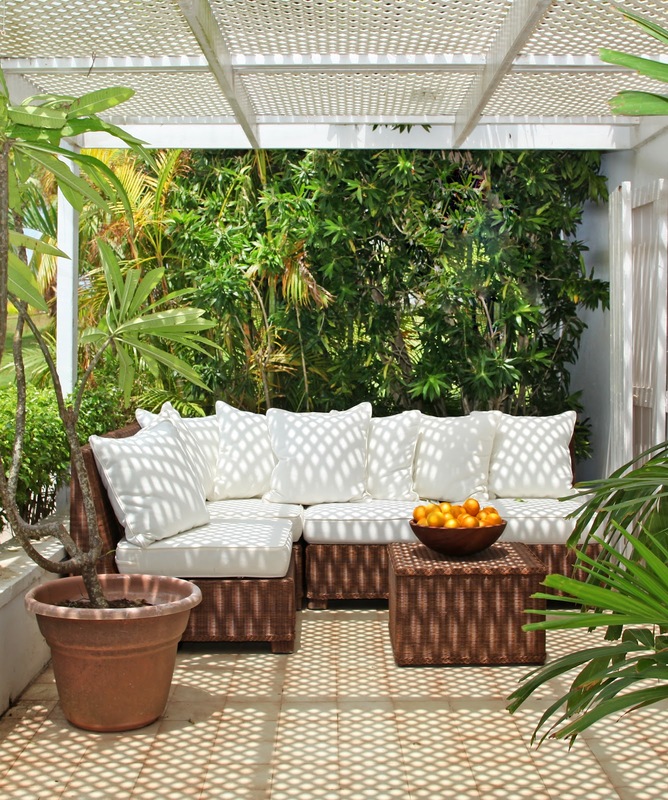 In her latest book, Rooms to Inspire by the Sea, Annie Kelly observes that, "To see a picture of a young, long-haired, blonde mother with a child leaning against a coconut palm tree is to immediately think of India Hicks." 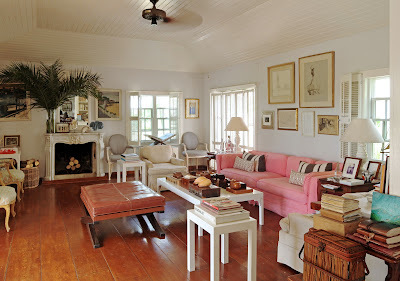 Since the late 90s, when photographs of Hicks, her family, and her renovated island house first appeared in Vogue, the images have become iconic. At least in design spheres. And I don't think I'm using iconic too loosely here. Years from now, when we look back at the aughts and the teens, I'm guessing the place Hicks and her partner, David Flint Wood, created will stand out. 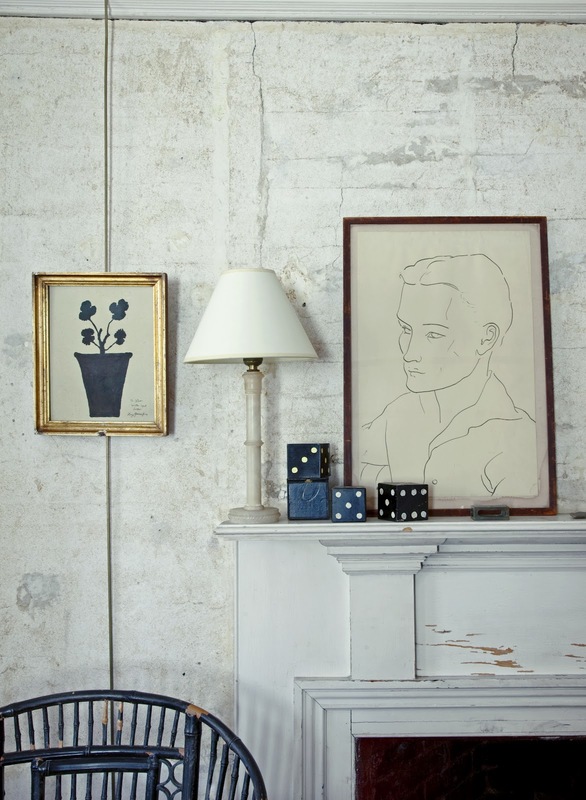 The look -- a highly personal, more laid-back, kid-friendly interpretation of Hicks Chic infused with Flint Wood's own penchant for the Brit Colonial aesthetic -- has been influential (hunt for traces of the duo's style the next time you flip through a spring/summer furniture catalog or visit a beach-side showhouse). All this to say, I'm happy Kelly and her photographer husband, Tim Street-Porter, offer their own expanded interpretation of the idyllic house. 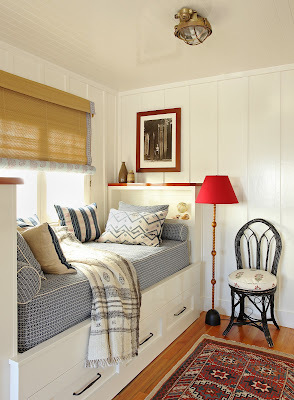 A tome chronicling contemporary seaside living wouldn't feel complete with out it. Kelly is able to share how it feels to be there, but also provides nuts-and-bolts details like which part of the roof came off during the house's expansion and which original elements were preserved. 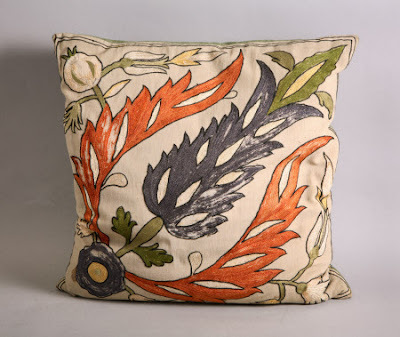 Of course, few artists/designers lovingly preserve the old and time-worn as John Derian does. 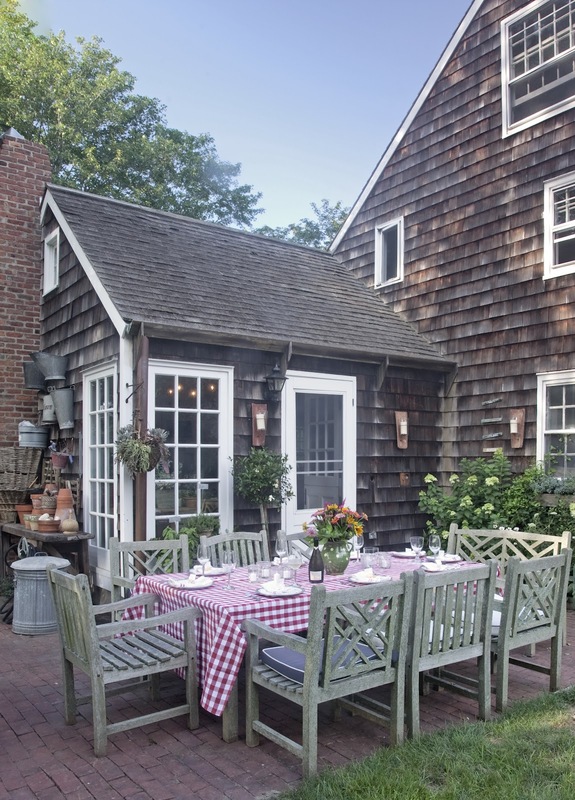 In the book, Street-Porter beautifully captures battered details throughout Derian's 1789 sea captain's house on Cape Cod, while, again, Kelly explains what was discreetly renovated and what was left alone. 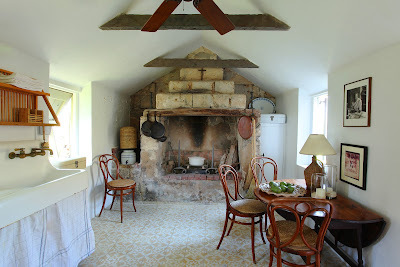 For example, five chimneys have been rebuilt but the patina of peeling paint remains. Above, black-and-white elements, including a Hugo Guiness drawing, contrast with weathered walls. As I mentioned the other day, Kelly gives in-depth coverage of twelve distinct houses and apartments, ranging from sleek, colorful spaces to charming East Coast shingled numbers, like Chris Mead and Zoe Hoare's home. Snippets of other dwellings are a bonus. 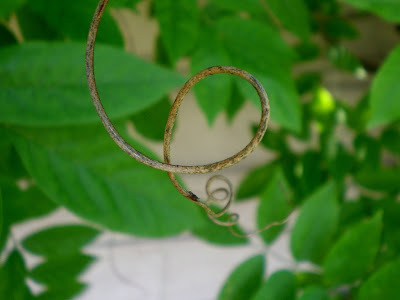 The common thread seems to be a strong sense of place and a nod to nature. On the wall of Tom Scheerer's Caribbean kitchen (with an incredible old fireplace discovered beneath pink-painted plywood) I spied the, well, iconic photo of Picasso in his sailor stripes. 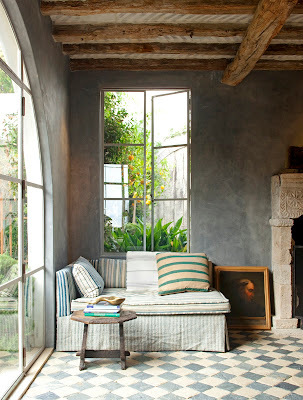 The 20th century master is sitting at a table covered with rustic linen very similar to Scheerer's window-pane-plaid sink skirt, and one of the interior designer's favorite elements, Thonet-style chairs, definitely call to mind Picasso in the South of France. 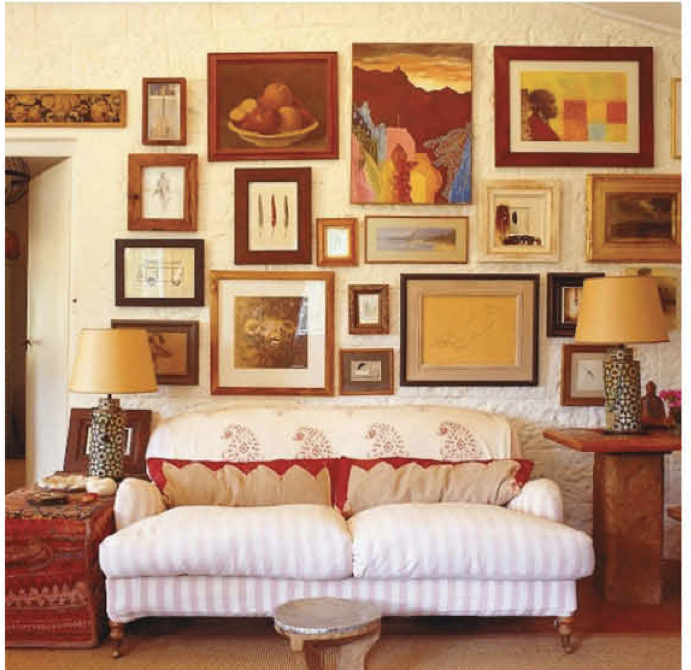 Without getting too theme-y, Steven Gambrel uses a luminous collection to reference his surroundings. 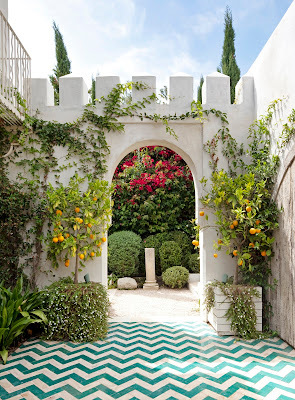 It's antiquarian Richard Shapiro's incredibly refined take on graphic pattern in Malibu. And a completely different kind of California dream: Peter Dunham's small space-maximizing version of the Endless Summer bungalow, directly above and below, made the cover. Somehow I've come to the end of this post without a single breathtaking shot of a pool or expansive ocean view. In fact, the book has an entire section devoted to swimming pools and loads of sea and sky. Come April, when you find yourself in a brick-and-mortar shop, thumb through a copy to soak it all in. You'll almost feel the salty breeze blowing through your hair. 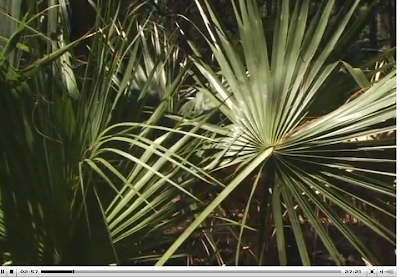 Meanwhile, I hope this tiny peek has given you a virtual spring break. 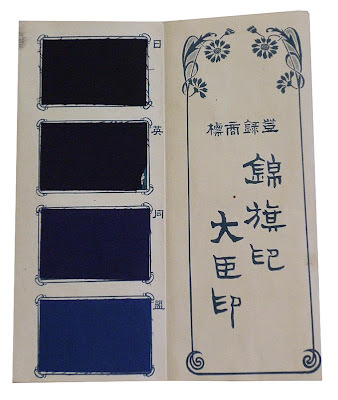 Today, while browsing the latest finds over at Sri, I came across this midcentury accordion-style sample book filled with 38 indigo cotton swatches. What gives added charm to the presentation is an outer cardboard folio, which the textile dealer describes as resembling a folding Japanese screen. 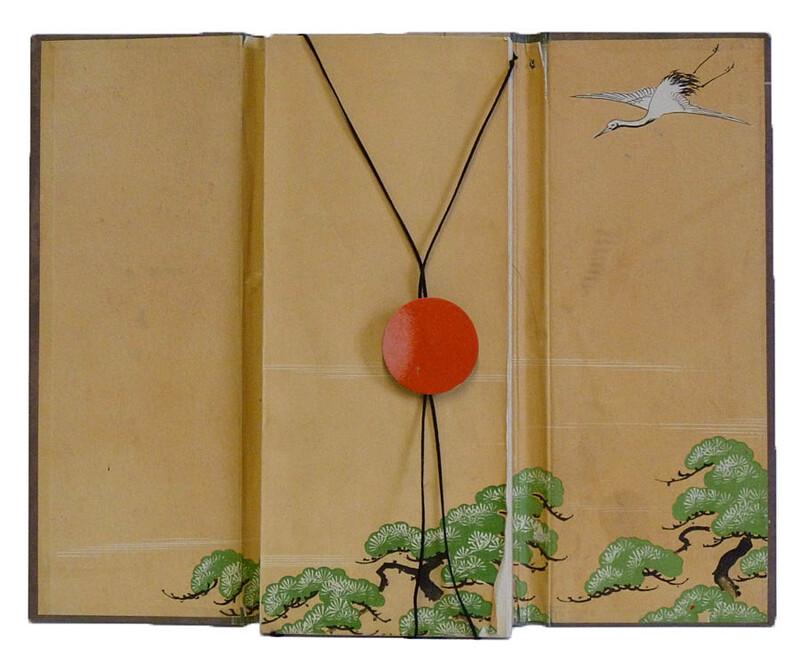 It's decorated with pine trees and a flying crane, and has a cord to secure the accordion. Whenever I see an interesting sample book, I tend to think of the Leman Album, a leather-bound collection of 18th-century British weaver/designer James Leman's watercolor designs for silk cloth. Nearly five years have passed since I first linked to the V & A's wonderful aquisition; in that time many more of the 97 designs have become viewable online. Here's an example of how the longer drawings fold to fit the format of the album. 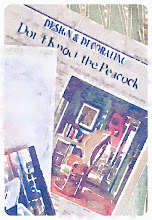 Related past post: Silks and Stripes. 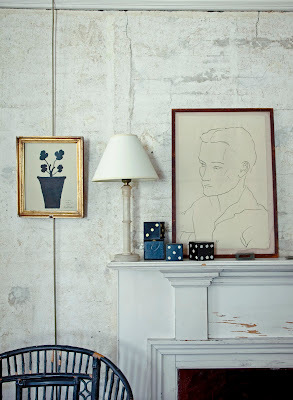 Consider Tim Street-Porter's photo of India Hicks's bedroom a teaser. 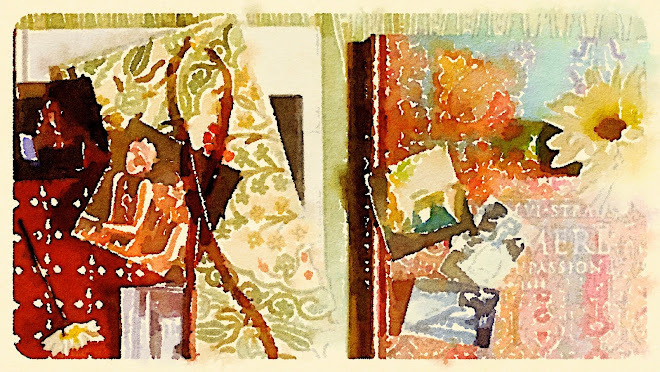 This week I had a chance to see an advanced copy of Annie Kelly's soon-to-be-released Rooms to Inspire by the Sea, and I need a few more days to hone in on which elements -- from roughly 240 captivating image-filled pages -- to highlight. Kelly focuses on twelve inspiration-file-worthy dwellings, each with a distinct spirit. Some are well known among design junkies, although seen here from fresh angles through Street-Porter's lens, while others are less familiar. And in addition to the complete tours of these houses (actually, there are a couple of beach-side apartments in the mix, too), Kelly examines details from other places. 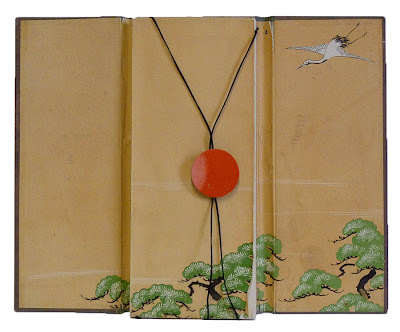 No surprise, I was won over when I cracked the book and landed on a spread of Doris Duke's Shangri La before even coming to the table of contents. When I came to the section on Hicks and David Flint Wood's Harbour Island house, I got out my magnifying glass. 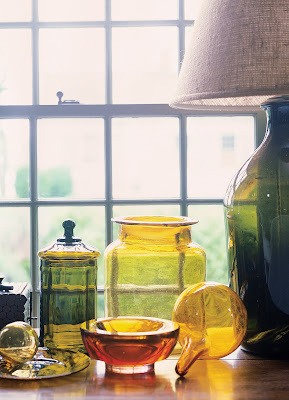 The photographs are certainly large and vibrant but with new (to me) tablescapes, vignettes, and views to savor, I didn't want to miss any tiny detail. One thing that grabbed my attention: beads hanging next to the couple's bed. 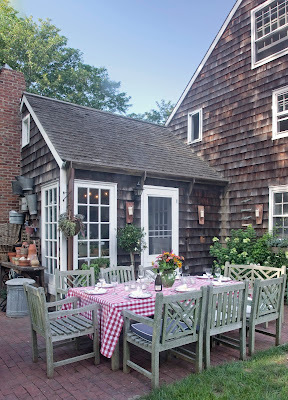 I couldn't help flashing back to a 2008 post with a tablescape by India's father, David Hicks. 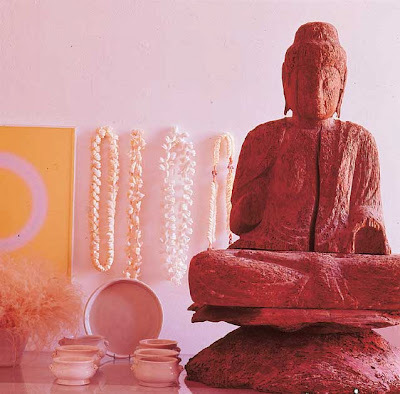 Note the Tahitian shell leis on the wall near a time-worn 15th-century Chinese wooden Buddha bought in Japan. According to Ashley Hicks, the abstract piece to the left is by Peter Sedgley. 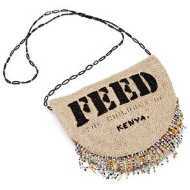 In addition to pouring over the images of Emma Campbell's Kenyan bungalow, I've been enjoying photographer Tim Beddow's African safari portfolio. There's a sidetable in one tent that could be a very distant cousin of these woven pieces spotted the other day at Anthro (Atlanta's Lenox location). And these, in turn, vaguely resemble some of the baskets included in Grass Roots: African Origins of an American Art. I've linked to the Museum for African Art's traveling exhibition before, but right now it happens to be in Wilmington, North Carolina at the Cape Fear Museum. Less than a week remains, though, to explore three centuries of superbly-crafted, coiled grass African and African-American baskets. Now viewable online is the related Grass Roots documentary which focuses on the Lowcountry sweetgrass art form. 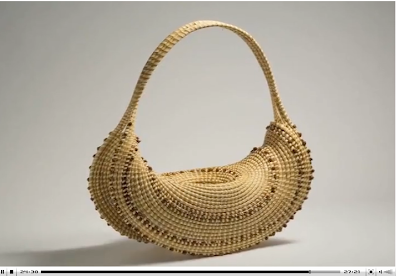 Masters including Linda Graddick Huger, Leola Wright and Mary Jackson are featured; above is one of Wright's stunning baskets from 1996. One of my obsessions this week is Emma Campbell's 1940s textile-and-art-filled colonial 'shack' just outside Nairobi (it's featured in The World of Interiors' latest issue). Initially I planned to spotlight this view of her living room as Gallery Wall of the Day and maybe comment on the work of Tarka Kings or the other artists represented in the grouping. But Campbell's international mix of fabrics -- although not pictured above, elsewhere in the bungalow she's got Swinging Sixties Brit designer Celia Birtwell mingling with Indian textiles and some great African Ewe cloths -- brought me back to the show I mentioned the other day, Cotton: Global Threads. Since the earlier post focused on India and contemporary artist Liz Rideal's dramatic sari installation, juxtaposed with Sultan Tipu’s Tent on loan from Powis Castle in Wales, today I wanted to add that African cotton features prominently in the exhibition, too. 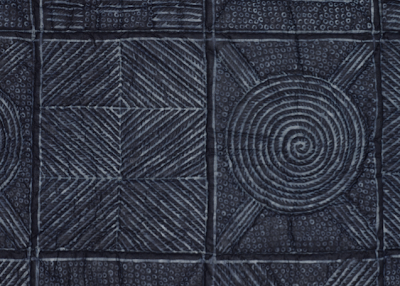 This page from the show's microsite gives a sampling of the old textiles displayed alongside recent works. 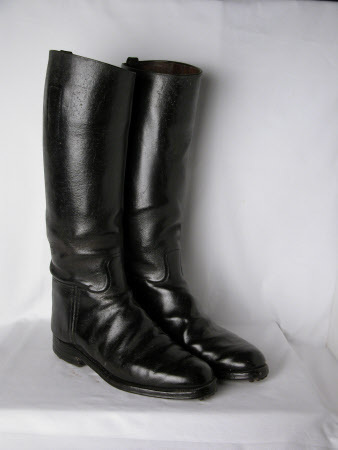 Many are from The University of Manchester's collection but others, particularly fashion, are loans. 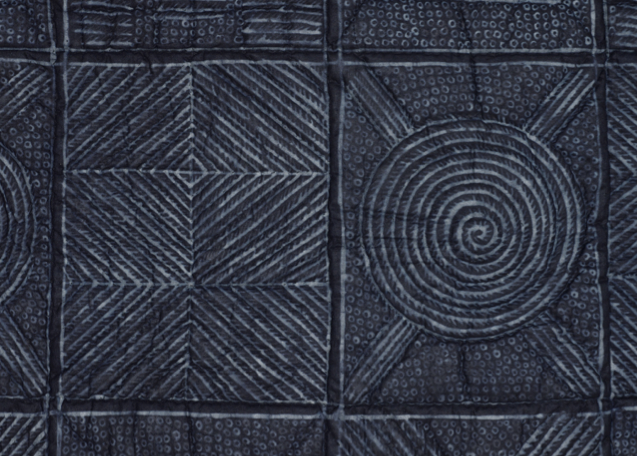 And that brings me to Liza Lemsatef Cunningham's terrific interview with Whitworth Gallery textile conservator Ann French. The informal, audio-recorded chat lasts roughly twelve minutes, with French explaining how she and her team painstakingly crafted mannequins to fit the loaned antique clothes. Well worth an afternoon break. After I shared a link to the University of Manchester's current exhibition, Cotton: Global Threads, Emile de Bruijn over at National Trust's Treasure Hunt kindly let me know that Dunham Massey, the grand Georgian house not far from Manchester, has a noteworthy collection of early Lancashire printed cottons. I ended up doing a little virtual exploration of the place on my own, aided by the staggering NT Collection Database (Emile writes about it here). 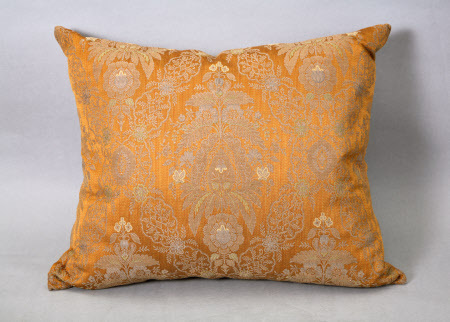 Of course Mr. Pamuk crossed my mind when I came across a Turkish pillow acquired during the Edwardian years. The stylized floral is beautifully embroidered with silk threads -- dark-blue, pale and mid-green, yellow, russet, ivory and black chain stitch -- on plain weave undyed linen. 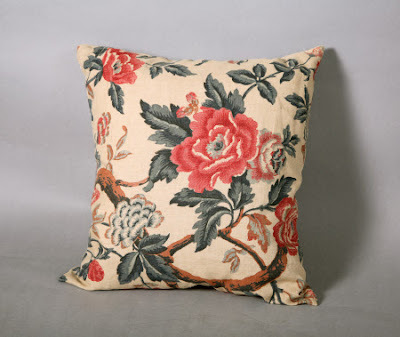 Ever the helpful researcher, Emile directed me to more Downton Abbey era (and later) pillows. The example above is Turkish in style but was made in England. Like its predecessor, this 1930s pillow is embroidered on plain weave undyed linen; the trim is three-strand twisted cord (original red silk) on a cotton core. The 1905 cushion above is characterized by a bronze and yellow silk warp with metal thread on a grey cotton core and yellow, blue and green cotton wefts. Its design incorporates plant motifs within a lace ground trellis. Here's a quintessentially English printed linen from the 1930s. 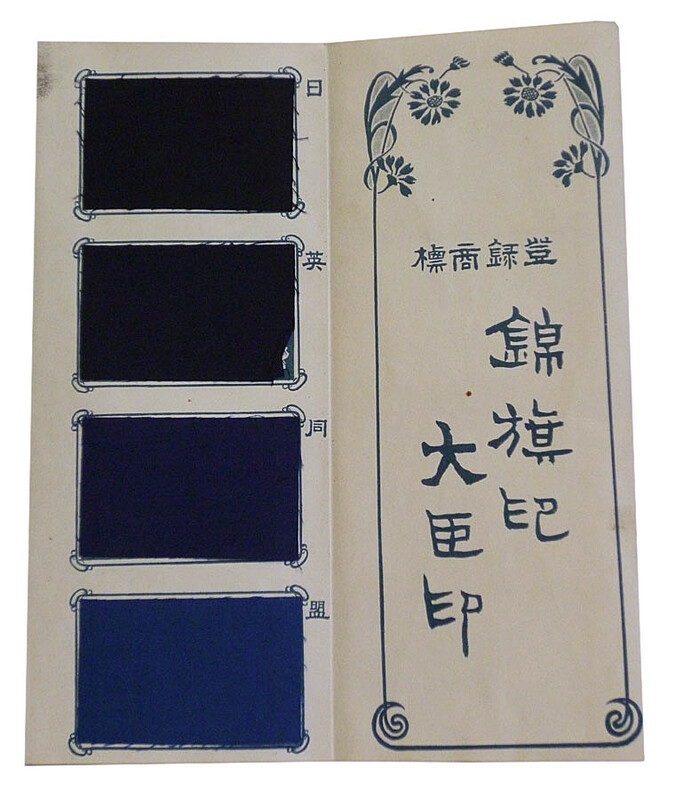 This silk embroidery on satin weave silk appears Chinese-inspired but is English-made; estimated date between 1905 to 1920. What's great about the database is the dizzying assortment of objects. 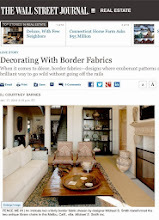 If you have an area of interest -- Missoni, wedding dresses, Turkish rugs, utilitarian brushes, riding boots -- give the search box a go. I think you'll be surprised by the results. 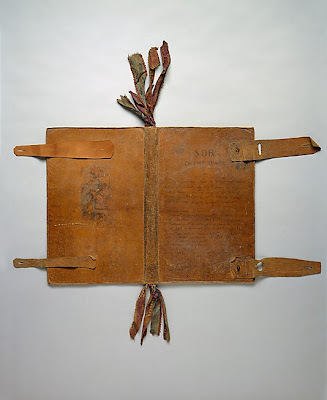 Each item in the collection database may not necessarily be on view at all times, but exploring the pieces online is a terrific way to get better acquainted with various NT houses and their former occupants, upstairs and down. I never need an excuse to focus on British taste and design, but with the Diamond Jubilee and Britain's Cultural Olympiad, 2012 is an especially great year to explore the field. 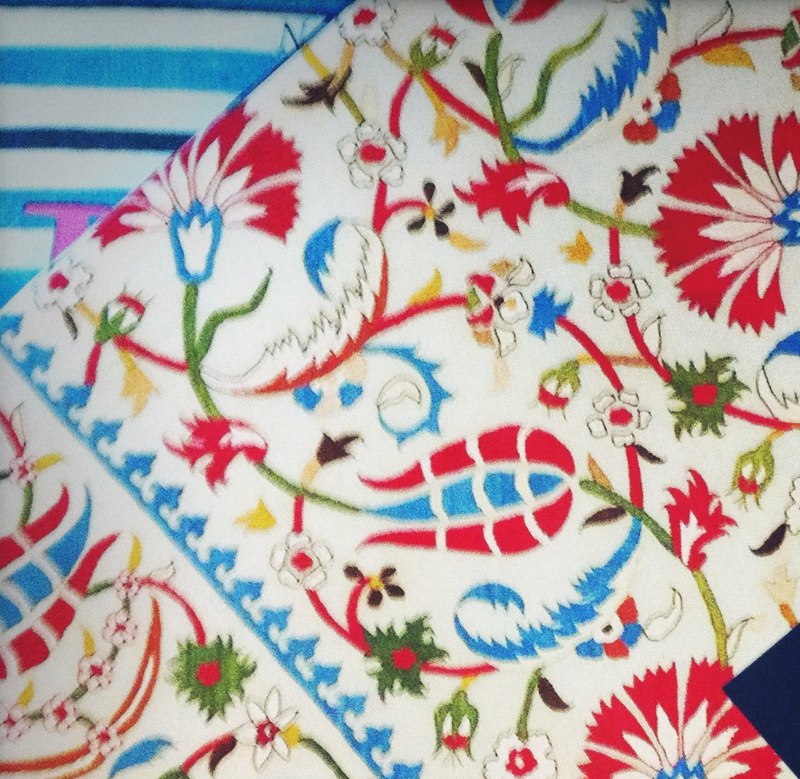 There are many exhibitions, books, and websites delving into UK style past and present. [Photo my own. Contemporary African beads purchased at Ann Mashburn. During the last few months we've looked at globally-influenced Victorians and Edwardians, Aesthetes, Bloomsburies, and Modernists (even mentioned Lewis Carroll, too). 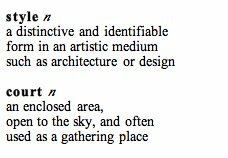 And whether I'm reading about the Victorian era or Post-WWII Britain, I keep coming across major festivals, exhibitions, and competitions organized to promote the commercial potential of design. Clearly Empire had a huge impact on 19th century collecting and manufacturing. For the London International Exhibition of 1872, 'peasant jewelery’ was emphasized. The South Kensington Museum (today the V&A) gathered from varied cultures around the globe examples of traditionally crafted pieces. 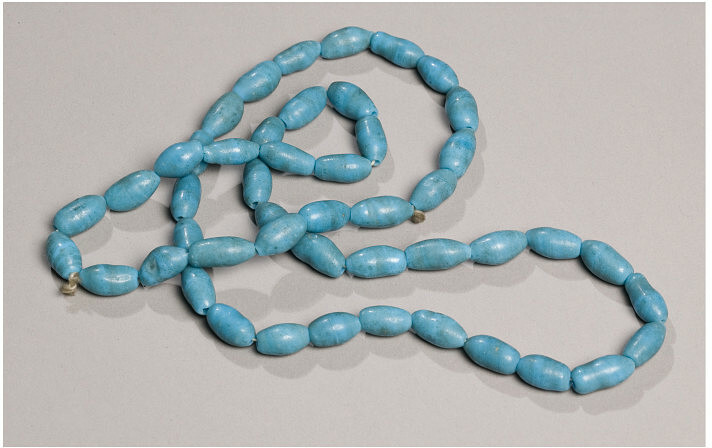 More on the Egyptian glass beads, pictured at the top, here. By the mid 20th century, there was more of a push to cultivate original British design. The first annual Designs of the Year Awards were launched in 1957 with a mission to find and celebrate the best homegrown products. While the name of the competition changed four times, the contest endured for three decades. Winning wares ranged from cameras to wellies and included furniture, textiles, fitted kitchens, bicycles, and telephones. Just as the V & A collected the 'peasant jewelry' in the 19th century, most of the winning modern designs were acquired by the museum. In her informative new reference book, Award-Winning British Design: 1957-1988, the V & A's Lily Crowther says that the acclaimed Palladio series produced by The Wall Paper Manufacturers was aimed at architects and interior designers. It was characterized by ambitious, large-scale repeats reflecting contemporary trends. 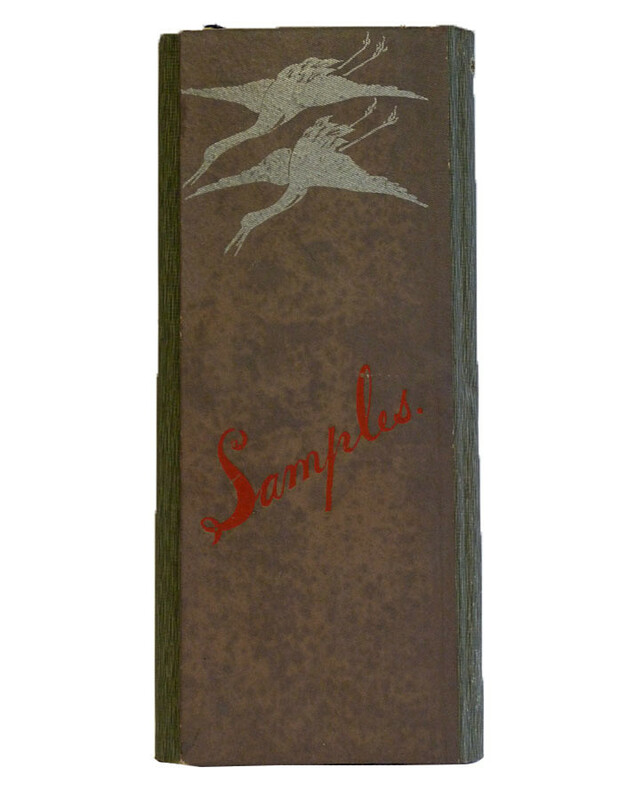 Cliff Holden's graphic, award-winning Trifoliate typified the early 1960s. The March IV racing scull designed by G.A.S. Locke and S.J. 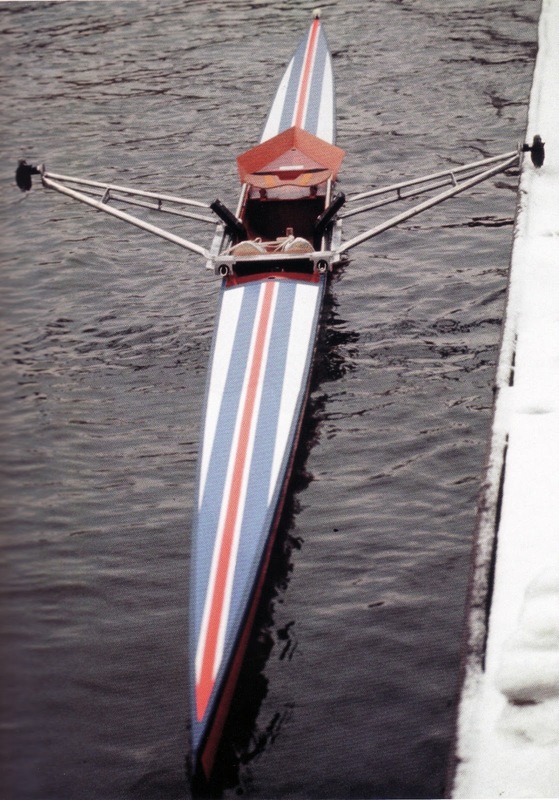 Adcock for Glyn Locke LTD was a 1982 award winner, also featured in Crowther's book. Peeking at the V & A gift shop's current offerings, I spied a replica of a 1970 winner, the TRIM phone (TRIM is an acronym for Tone Ringer Illuminated Model), the first phone to ring using a modern electronic warbler instead of a bell. A few other iconic British goods can be seen here, but Crowther's compact edition provides a really comprehensive, well-illustrated survey of the late 20th century.